A friend is convinced we need more romance novels featuring characters in their 50s and 60s, instead of their 20s and 30s. In other words, our ages, as opposed to the ages of our children. I disagree. I reject a simplistic model of literary identification, where we identify with characters who are like us. A major pleasure of literature (and film) is identifying with characters who are not like us (and a challenge for all authors is to encourage that identification). Second, while we grudgingly acknowledge that our bodies are not quite they same as they were decades earlier, we generally don’t think differently. We may approach a new relationship with some experience in matters of the heart, but that rarely makes it any easier. It always “feels like the first time.” (My goodness, is that song really 40 years old?) And it has not escaped my notice that the Harlequin Next imprint did not last. 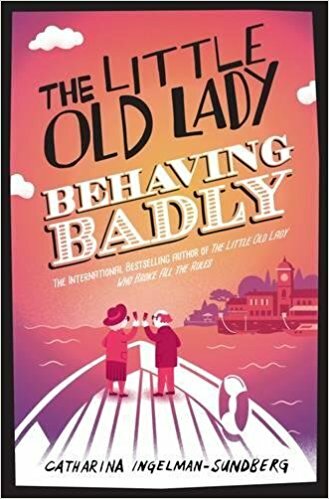 As an example of a romance featuring older characters, I was introduced to The Little Old Lady Behaving Badly, by Catharina Ingelman-Sundberg (and translated from Swedish by Rod Bradbury). This is one in a series of stories featuring The League of Pensioners, a group of elderly folks who rob banks and commit other crimes to stave off boredom and help others. The plot is a series of capers, from robbing a bank to defrauding Russian oligarchs, mixed with various other endeavors to improve life for older folks and low-paid health care workers. These include opening a restaurant and creating a dating app. There are also two romance sub-plots. Despite the large cast and many activities, or perhaps because of them, the pace occasionally sags over the almost 500 pages of this book. On the first page, some awkward character introductions suggest I should have started with the first book in the series, The Little Old Lady Who Broke All the Rules. Capers are distinguished by humour, but after too many close calls with resolutions in the tradition of cozy mysteries, attempts to build suspense are not taken seriously. There is some satisfaction in seeing a feisty older woman raise the rip-off stakes after ill-mannered mobsters ridicule her age and appearance. This is one of several fun episodes. Much of the story milks the joke of seniors being unexpectedly devious and clever, and while it’s good to remind folks that not all seniors are contentedly slurping down mashed peas in nursing homes, constantly bringing that up as the contrasting normal actually reinforces the stereotype. The romance subplots are less comic, more realistic and therefore more effective at reminding readers that romance is for all ages – if anyone needed reminding. I had no problem identifying with Martha and her romantic concerns, though she is several decades older than me.